I’m doing an event on Thursday afternoon — “How To Launch A Successful ICO,” presented by TopLine Comms. The target audience is businesses looking to raise funding. I’ll be discussing why you’d better do everything absolutely properly, and talking a bit about KodakCoin (one of the case studies). It’s free, but you have to register. All three panelists are called David. Jay Clayton from the SEC extends the offer of help — “Come see us” if you want to do an ICO. KodakCoin’s pre-ICO buyer, Global Blockchain, is trying to apply sufficient thrust to make this pig fly — six National Basketball Association or National Hockey League arenas will accept this as-yet-nonexistent crypto token for … something, in the future, when they write some software. The SAFT is currently running! I just got passed a document detailing how, while KodakCoin’s first round token offering was fully subscribed at $3,250,000 … the second round token offering was aiming for $6,750,000 — and netted only $880,000. I wonder how the current round — hoping for $73.5m — is going. Somebody’s made $20m by scanning across the Internet for copies of Ethereum full-node client geth misconfigured to have port 8545 open. By default, it only listens on the localhost — but, of course, users fiddled with it. This has been going on since March. Be your own bank! With everyone running slight variants on the same hashing algorithms, 51% attacks are just a thing that happens these days. The hazards of the altcoin life. Even if you go full mathcoin, you have problems like EOS being buggy trash. That’s as well as being literally worthless, of course. "We'll put ownership of IP rights on a blockchain"
Translation: "we want to privatise the IP system, create a monopoly who will charge high, unpredictable fees, and remove any judicial oversight from a system that relies on that to curb the worst abuse". I was at a housing charrette talking about how to better engage the community in a new building and a CEO who should know better said, "This would be a great use case for blockchain." The unparalleled experience of using bitcoins to book a hotel room through Expedia. You’ll be relieved to know it’s all the user’s fault, and definitely not anything wrong with the Bitcoin ecosystem, no no no. Wikipedia hasn’t taken Bitcoin donations since Coinbase deprecated their payment gateway in late April. You can still rid yourself of the shameful taint of owning BTC, ETH, BCH or ZEC at the Internet Archive. David Golumbia interviewed in Salon about how Bitcoin brought its right-wing conspiracy theories into the mainstream. The reactions to this article from Bitcoin advocates are incredulity — the crypto subculture seems to have forgotten the political aims of the cypherpunk subculture it originated in, and that these ideas literally sprang from goldbug and “international banker” conspiracy theories. Go read David’s book, The Politics of Bitcoin (US, UK) — I knew I had to write a chapter in the book about Bitcoin’s libertarian roots, and The Politics of Bitcoin put together my reading list for chapter two for me. The York Festival of Ideas event “Cryptocurrency: Hype or technological revolution?” on Saturday evening was great fun. Rory Cellan-Jones moderated, Bebo White played advocate, Frances Coppola and I were the embittered nocoiners. I even sold five paperbacks — I would have sold more, but it seems like a surprising number of people in the UK just don’t carry cash any more. I don’t think we got a recording, but there’s some tweeted photos above. Simon Chandler in CryptoNews: The Great Backlash Against Blockchain Hype — with quotes from me. 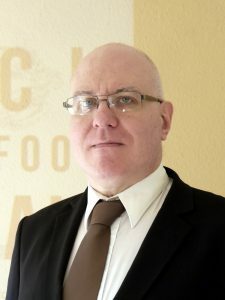 I got what I think is my first academic citation in “Blockchain Use Cases and Their Feasibility” by Kaspars Zīle and Renāte Strazdiņa in Applied Computer Systems: The Journal of Riga Technical University vol. 23 no. 1. J. P. Koning also cites me in “Bitcoin as a Novel Financial Game.” This is for the AIER, a “sound money” (goldbug) think tank — but even then, he says: “One of the greatest tricks Satoshi Nakamoto, the creator of Bitcoin, ever played was convincing everyone that his invention was just like a banknote, when it was actually a novel type of zero-sum financial game.” Told you even Austrian Economics fans don’t like Bitcoin. 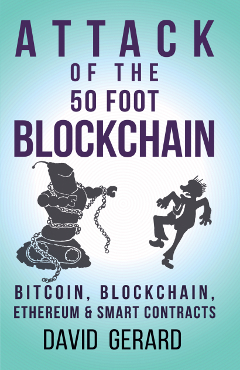 Attack of the 50 Foot Blockchain is cheap on Kindle Canada this month — CDN$4.49 for the ebook! Get one to go with your paperback! any minute until bitcoiners start saying "the price doesn't matter"
To be fair, the most obvious advice I seem to be extracting from your writings on “how to launch a succesful ICO” is: Don’t! But, of course, there’s a lot of interest and maybe somebody does have something worthy they’d like to be funded. OTOH, how can you expect to be trusted if you go where fraudsters and scammers conglomerate? But of course, there’s still good advice to give: If you must, then at least be honest about what you’re doing. “Don’t” was pretty much the consensus opinion of the panel – or if you do, it’s a security, so take it seriously as one. Writeup and video link here.